Although Guinea has made significant progress in the fight against the three diseases, despite a challenging operating environment, there are significant weaknesses in supply chain management and there are areas related to managing grant implementation that require improvement. These were the findings of an audit of Global Fund grants to Guinea conducted by the Office of the Inspector General (OIG). A report on the audit was released on 25 August. The Global Fund has signed grants for over $228 million and has disbursed $176 million in the fight against HIV, TB and malaria in Guinea since 2003. It currently has four active grants in the country. The audit covered two grants: an HIV grant (GIN-H-CNLS) managed by the Comité national de lutte contre le Sida (CNLS), and a malaria grant (GIN-M-CRS), for which the principal recipient (PR) is Catholic Relief Services (CRS) Guinea. The audit covered the period January 2015 through December 2016. The audit had two objectives: (1) to assess the effectiveness of the supply chain; and (2) to evaluate the adequacy of risk mitigation measures in the management of grants. The OIG found that the supply chain is generally able to deliver medicines to the service delivery points. However, it said, major inefficiencies and weaknesses exist in the supply chain processes that compromise the ability to perform effective supply planning and management of the inventory of drugs. The OIG said that this is due to inadequate in-country supply chain oversight for the HIV grant and the Secretariat’s weak assurance mechanism. The OIG rated the effectiveness of supply chain management as “significant improvement needed." The OIG found that the risk mitigation measures instituted by the Secretariat have addressed many of the related risks and achieved good programmatic results, especially under the malaria grant. However, it said, several challenges limit the effectiveness of grant implementation activities, factors that include the country context, the limited capacity of CNLS, and gaps in supervision and management of the sub-recipients (SRs) by the PRs. The OIG rated the risk mitigation measures related to grant implementation as “partially effective." The Global Fund’s investment in Guinea has contributed to the reduction in malaria mortality and an increase in the number of HIV patients on antiretroviral treatment, the OIG reported. Malaria prevalence decreased by almost 30% between 2003 and 2014. About eight million bed nets have been distributed through a universal mass campaign with the support of Global Fund and other partners in 2016. Similarly, the OIG said, antiretroviral treatment coverage has increased from 4% to 46% of the number of people living with HIV between 2003 and 2015. The Global Fund is the main donor of Guinea’s HIV program. Over 60% of the budget for the HIV grant is for the procurement of medicines and other health products. The OIG reported that the Global Fund and partners have supported the country to address some of the systemic challenges which affect efficient storage and distribution of medicines in a challenging environment like Guinea. Resources have been earmarked to expand storage capacities in five of the six regional warehouses. A distribution plan has been developed to support last-mile delivery of HIV medicines by the Central Medical Stores (CMS) starting in March 2017. A similar plan has existed for the malaria grant since 2016. Limited reliable data affecting quantification of medicines. Guinea uses only morbidity data as the basis for determining how many ARVs are needed, the OIG revealed. Estimates of the need vary significantly (from 28,000 to 44,000 patients). In addition, Guinea has adopted a new anti-malaria treatment regimen but is still basing its forecasts on the old regimen, which had different treatment ranges. This – and the expiry of some medicines supplied by partners – have impacted the availability of anti-malaria medicines for different age groups. For instance, the country currently has an excess of nine and 12 months of medicines for teenagers and adults, respectively, but the stock levels of medicines for babies and infants are below the recommended minimum level of two months’ stock. Inadequate inventory management systems. The CMS has been supported by the Global Fund and partners to improve its inventory management systems, the OIG said, but there are still problems – such as data entered on the system not being backed up by the CMS. This has resulted in the loss of important data. Potential loss of quality of medicines due to weak storage practices. Two out of three regional hospitals visited by the audit team had malaria medicines above their storage capacities. Environmental conditions (temperature and humidity) in storage rooms are not monitored in all the facilities and warehouses visited, the OIG found. The gaps in storage practices could compromise the quality of health products. The audit found that the challenges in quantification and supply planning have contributed to expiries and stock-outs of medicines across the supply chain, especially under the HIV program. For example, based on an analysis of antiretroviral medicines (ARVs) currently available compared to program targets, the OIG estimated that there are $3 million worth of ARVs financed by the Global Fund in the CMS that were likely to have expired in 2016. This amount represents about 38% of the ARVs procured under the HIV grant as of April 2017. Subsequent to the OIG audit, there was an agreement to redirect some of the soon-to-expire medicines to other countries. However, before this could happen, the ARVs were destroyed in a fire. In addition, the OIG said, stock outs of HIV test kits were noted at health facilities. The Secretariat and the PR were not able to identify these inefficiencies, the OIG stated, because the assurance arrangements for the supply chain – both in-country and at the Secretariat – are not adequate. While the procurement-related risks have been mitigated through the use of the Pooled Procurement Mechanism (PPM), the OIG stated, the supply chain risks have not been adequately identified or mitigated. The country team and the local fund agent’s (LFA’s) review of the PR’s quantification of antiretroviral medicines did not identify the overstated needs (mentioned above), the OIG said, and, therefore, did not reveal the substantial exposure to drug expiries. The assurance provider’s review of stock levels as part of the progress update and disbursement request (PUDR) in April 2016 did not identify the excess stock levels in the country. In addition, the OIG said, there is limited coordination among the various players with respect to quantifying ARV needs. evaluating the national procurement and supply chain management committee for supply planning and updating its terms of reference. CRS, the PR for the malaria grant, has coordinated its activities well with the (U.S.) President’s Malaria Initiative (PMI) which has boosted implementation of the malaria grant, as well as its results, the OIG found. The HIV grant has not fared as well. The limited availability of in-country partners to support the program and the limited capacity of the PR, the CNLS, and of the national HIV program have negatively affected implementation of the grant. 53% of the regions did not collect and transport blood samples to the national reference laboratory for screening. As a result, the OIG reported, only half of the annual PMTCT target related to children has been achieved. The audit identified that supervisory activities are not regularly performed. Global Fund grants have provided resources to enable the implementers to conduct regular supervision. However, the OIG said, the absence of a national integrated supervision framework and plan has resulted in a silo approach to supervisions. For example, the various units under the national programs conduct separate supervision activities in the same facilities at different times, resulting in potential duplications. In the OIG’s view, implementation of supervision activities has been negatively affected by the limited availability of health workers at the regional and district level and limited planning and coordination between the different disease programs. The OIG said that major improvements are required in the PRs’ management of their SRs. The OIG noted that the PRs did not regularly perform quarterly programmatic and financial review of SRs. The OIG provided examples of transactions that were problematic. In one instance, the CNLS made disbursements of $981,026 in August 2016 to an SR when previous advances of $324,087 disbursed in March 2016 had still not been accounted for. In another case, expenditures incurred by three SRs amounting to $1,939,692 were not included in the progress report submitted by CRS to the Global Fund in 2016. The OIG attributed the problems related to the HIV grant to capacity constraints on the part of the CNLS and the limited availability of in-country partners to support the HIV program. The OIG indicated that the Secretariat had recognized the capacity problems and had engaged consultants and international entities to support CNLS. For example, UNICEF was mandated to implement the PMTCT supervision component of the grant. The OIG said that UNICEF was brought in because of the weak capacity of CNLS and the national HIV program. However, the OIG said, UNICEF subsequently engaged the national HIV program to conduct these supervision activities without providing commensurate capacity building, despite the national program’s weak capacity. The OIG stated that supervisory arrangements have remained ineffective despite the contribution of consultants and international entities. The OIG reported that the Global Fund has instituted mitigation measures in response to the high fiduciary risks on the portfolio. The measures include use of fiscal agents (FAs) at the CNLS and a zero-cash policy at the SR level. Under the zero-cash policy, the PRs make payments to suppliers on behalf of the SR. The zero-cash policy was introduced to address fiduciary risks at the SR level. This has reduced the extent of cash managed directly by the SRs. However, the related gaps in procurement processes of the SRs are not identified and addressed by the PRs. The FA routinely reviews transactions and justifications by the PR before payments are made. However, the terms of reference of the LFAs have not been tailored to reflect these additional mitigation measures and assurances introduced by the Secretariat. This is the first OIG audit of the Guinea portfolio. 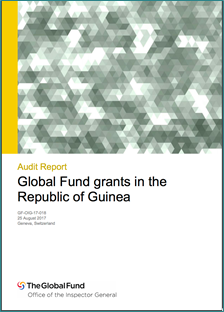 However, Guinea was included in the sample of countries in the OIG’s audit of grant management in high risk environments, published in January 2017 (see GFO article). The audit found that there was an absence of an overarching framework to support grant management in high risk environments; inadequate balance between country ownership and short-term measures to support grant implementation; and gaps in monitoring of the short-term measures instituted in such environments. The related AMAs are currently being implemented. One of the grants not included in the Guinea audit was an HIV grant managed by Population Services International (PSI). In its report, the OIG noted that PSI will not continue to implement grants in Guinea when its current grant expires in December 2017.